Probe-tube placement is a common skill in audiology that must be mastered to provide evidence-based care in audiological practice. Guidelines published by regulatory bodies, academies and associations recommend the use of real-ear probe-microphone measurements to obtain individual measures of real-ear-to-coupler difference (RECD) values at assessment and verification, as well as real-ear verification of hearing aid performance for individuals of all ages whenever possible.1–4 According to these guidelines as well as recent literature, the probe-tube must be inserted to within 5 mm of the eardrum to obtain accurate measurements.5–7 Contact with the eardrum must be avoided as it will cause physical discomfort, can cause a patient to lose confidence in the technical skills of their clinician, and in pediatric cases, can lead to an early appointment conclusion due to reduced level of cooperation from the child after eardrum contact has occurred. Simulation training has been used for many years and is increasingly becoming a routine part of education and training in many allied healthcare professions. Table 1 provides a list of advantages of simulation-based training over traditional methods of training.10 The use of simulation training within audiology may provide a method that would facilitate education and training of probe-tube placement and real-ear measurement for audiology programs and for continuing education opportunities. With lack of confidence in placing the probe-tube being cited as a reason for poor compliance with real-ear measurements, the use of simulation may improve clinical use of probe-tube placement in practice. Increased satisfaction with the learning experience. In an effort to increase the use of real-ear probe-microphone measurements in audiology by improving self-confidence, knowledge, and skills, Koch and colleagues developed a Manikin-based probe-tube placement training simulator for use within clinical practice and continuing education programs.11 Initial development included a low-fidelity simulator pictured below (Figure 1) consisting of a styrofoam head model, a 3-D printed flexible ear, and a camera system mounted inside the head to view the ear canal. The ear canal was printed in a transparent material so users received a direct image of the inside of the canal. When coupled with a developed software program, the user receives real-time feedback of the probe-to-eardrum distance. Both an adult and pediatric simulator with corresponding ears were developed so that practice for adults and children can occur. Figure 1. Early version of the Manikin-based probe-tube placement simulator. A study was conducted to evaluate the face and content validity of the first-version of the Manikin-based probe-tube placement simulator using experts in probe-tube placement (n=12) and by collecting quantitative and qualitative feedback.11 Results showed that the average distance-to-eardrum probe-tube placement for all participants was 3.74 mm (SD=1.82) for the adult model and 2.77 mm (SD=0.94) for the child-sized ear; both of these are consistent with what clinical practice guidelines recommend. The simulator lets the user know when the eardrum has been touched with the probe-tube by producing an audible sound (“Ow” [adult]; child-cry [child]). Contact with the eardrum was made in 12% of the time across trials for the adult-sized ear and 5% of the time across trials for the child-sized ear. Face and content validity of the probe-tube simulator was moderately high. Low scores for both the adult and child models were attributed to the texture and stiffness of the 3-D printed ear and the otoscopic view of the ear canal and eardrum. Many of the advantages noted by the experts for the use of the Manikin-based model in practice reiterate those described in Table 1. The greatest benefits repeatedly mentioned by our experts were the ability for student clinicians to repeatedly practice probe-tube placement without having to have a peer sit for the measurement; the reduction in risk of harm while practicing, and the increase in student’s skill and self-confidence in making the measurement. Culminating the feedback received by the expert’s usage of the simulator, a second iteration of the probe-tube placement simulator was developed. 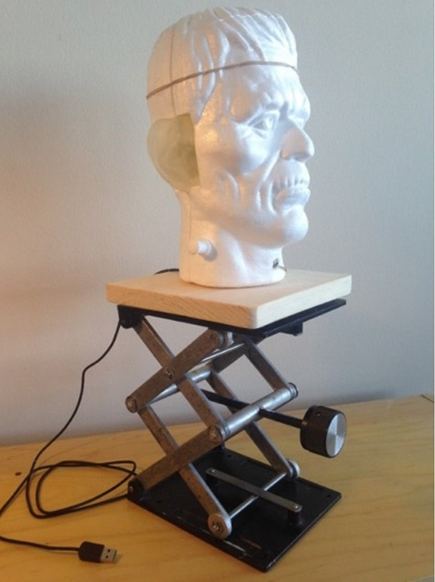 In the second iteration of the Manikin, the styrofoam head was changed to a 3-D printed head, the printed ears were molded with silicone to increase the flexibility and realism of the material, and the software program was better optimized for feedback mechanisms (see Figure 2A, 2B, and 2C). Figure 2. The second and most recent version of the Manikin-based probe-tube placement simulator showing the (A) Manikin, (B) a student hard at work, and (C) the inside assembly showing the camera and medial portion of the ear canal. A second study was conducted to evaluate whether skills learned on the simulator successfully translate to clinical scenarios. This skills transference study used the updated Manikin-based simulator with students in the first-year audiology program (n=25) at Western University.10 The participants were randomly assigned into one of two groups: the simulator group, or the control group. The control group trained with traditional methods (using each other and volunteers) while the simulator group did the same but supplemented their training with the simulator. All participants were tested before and after a training period to determine if the simulator had any effect on their probe-tube placement competency level. Results found the simulator to have a positive effect on the student’s performance, with those who used the simulator to be less likely to contact the eardrum, more likely to perform a better RECD measurement, and more likely to appear confident to a trained observer. Results of the two studies summarized here provide initial evidence that the Manikin-based probe-tube simulator is considered a valuable teaching tool by experts and that it can be used in clinical education environments to improve the ability for students to practice probe-tube placement, and improve their knowledge, skills, and self-confidence in making this important clinical measure. Future work looks to incorporate this simulator into training programs and evaluate use cases outside of probe-tube placement in which this manikin-based simulator may provide teaching and training value. American Academy of Audiology (AAA). American Academy of Audiology Clinical Practice Guidelines on Pediatric Amplification; 2013. Available at: http://www.audiology.org/resources/documentlibrary/Documents/PediatricAmplificationGuidelines.pdf. British Society of Audiology. Guidance on the use of real-ear measurement to verify the fitting of digital signal processing hearing aids. Br Soc Audiol 2007;1–20. Anderson MC, Arehart KH, Souza PE. Survey of current practice in the fitting and fine tuning of common signal-processing features in hearing aids for adults. J Am Acad Audiol 2018;29(2):118–24. Valente M, Abrams H, Benson D, et al. Guidelines for the audiological management of adult hearing impairment. Audiol Today 2006;18(5):1–44. Koch RW, Moodie S, Folkeard P, et al. Face and content validity of a probe tube placement training simulator. J Am Acad Audiol 2018. doi: 10.3766/jaaa.17114. Vaisberg JM, Macpherson EA, Scollie SD. Extended bandwidth real-ear measurement accuracy and repeatability to 10 kHz. Int J Audiol 2016;55:1–7. Moodie S, Pietrobon J, et al. Using the Real-Ear-to-Coupler Difference within the American Academy of Audiology Pediatric Amplification Guideline: Protocols for Applying and Predicting Earmold RECDs. J Am Acad Audiol 2016;27:264–75. Bagatto MP, Seewald RC, Scollie SD, Tharpe AM. Evaluation of a probe-tube insertion technique for measuring the Real-Ear-to-Coupler Difference (RECD) in young infants. J Am Acad Audiol 2006;17:573–81. Alanazi AA, Nicholson N, Thomas S. Use of simulation training to improve knowledge, skills, and confidence among healthcare students: A systematic review. Internet J Allied Health Sci Prac 2017;15(3):Article 2. Koch RW, Saleh H, Folkeard P, et al. Skills Transference of a Probe-Tube Placement Training Simulator. Poster Presented at: International Hearing Aid Research Conference (IHCON), Lake Tahoe, CA, USA; 2018. Moodie S, Rall E, et al. Pediatric Audiology in North America: Current Clinical Practice and How It Relates to the American Academy of Audiology Pediatric Amplification Guideline. J Am Acad Audiol 2016;27:166–87. Rob Koch is a recent Master’s graduate from Western University, London, ON in Biomedical Engineering and is the President and Founder of AHead Simulations. He has recently been awarded Western's 2018 Governor General's Gold Medal in part for his work on the Manikin-based simulator project. Sheila Moodie is an Associate Professor in the School of Communication Sciences & Disorders at Western University and an Associate Member of the National Centre for Audiology at Western. She contributed her expertise on knowledge translation and implementation science for this project.